You’d be lying if you haven’t had a difficult time cleaning up the past and throwing away the things you don’t need. You say you’ll just keep a thing or two but then as time goes on, they just keep on adding up. In Francesca Pazniokas’ Keep, sisters Jane and Kara try to help their younger sister Naomi clean up her life after a tragedy. Produced by Wide Eyed Productions and Mastodon Theatre Company, Keep is a drama that hoards emotion. While trying to cope with the loss of sister Margo, Naomi holds on to the little things, literally. Naomi has become a hoader, turning her apartment into a treasure trove of junk. From a Russian stacking doll of boxes to the remains of a pet, Naomi can’t let go of anything. When older sisters Jane and Kara arrive to help Naomi with letting go of the past and the present, instead jabs are tossed and delicate relationships are tested. Francesca Pazniokas’ play is a fascinating exploration of a mental illness that many only view as an entertaining reality show. Pazniokas goes beyond the shock value to reveal the inner struggles of an individual coping with grief. It’s easy to liken Pazniokas’ text to someone like Sarah Ruhl. The world of magical realism is ever-present. But Pazniokas sometimes gets lost in language that the plot falters. There’s a fine line between styles that Pazniokas treads. And when she gets wrapped up in the poetry of her text, the accessibility is gone and the story is lost in the mountains of junk. Regardless, Keep evokes unsettling feelings. When it comes to creating a family, the sisters were a bit one-note. They each had strong action and objective, but it never strayed. The girls lacked depth. It was a very monotonous journey playing the guilt and blame game. That was until reality disappeared to reveal the magical moments. That’s when things seemed to fall apart. The backstory that Pazniokas establishes for the sisters is a bit convoluted. Who Margo is to each sister is drastically different and thus who Margo is in this world needs to be meticulous. Leslie Marseglia gave Margo an edge of angst. And it was intense. Even when Margo had softer moments, Marseglia was rough. 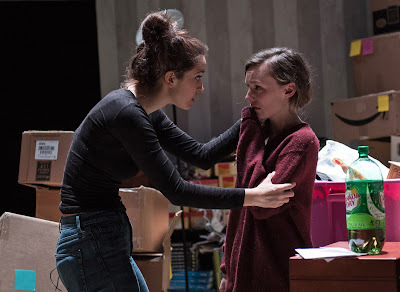 Even though her presence in the world of Keep was different, there was a disconnect to Marseglia’s performance that changed the perception of the play. It’s hard to say who hard a harder part, Leslie Marseglia or Kim Krane as Naomi. Krane had to portray a woman who was not all there while remaining truthful. Krane brought an essence of delicate sincerity that allowed emotion to finally burst out of her soul. Jenna D’Angelo brought the sarcasm as Kara. Of the quartet, D’Angelo’s character was the strongest and most rationale. Being the voice of reason can be boring but D’Angelo broke out of that easily. There was an empathy within the tough façade. Madison Comerzan as Jane was tediously bubbly. As the sister with the optimism, Comerzan was forced into a character that you enjoyed seeing get goofed on. Though the clarity of character was a bit mess, Comerzan was enjoyable. Individually, each actress brought something different but chemistry was lacking. Yes, we know that there is a disconnect in the family, but without context, you’d never believe the quartet were supposed to be related. If you enter TBG Theatre and immediately feel overwhelmed, you should. Alfred Schatz’s set was a perfectly strategic junkyard of memories. As the characters learn, you should be wary of what lies beneath. The labyrinth director Stephanie C. Cunningham had to work with had obstacles, but for the most part, Cunningham triumphed. When it came to the journey of the text, there were some beats lost and transitional flaws. With a balance of naturalism within the magic, blending the two needed to be as seamless as possible. Lighting designer Cate DiGiroiamo had some trouble at times. It’s always important to see the actors but when the script has a blackout moment, darkness is believable is imperative. The stage darkness didn’t quite read. The transitional music from J. Alexander Diaz was an interesting classical synthesized vibe. And it seemed to work. It prevented the mood to drop to a deep despair. There are times in storytelling that a plot can’t be wrapped up neatly. Sometimes it ends ambiguously. Sometimes it’s more abrupt. But whatever the case may be, it needs to feel complete. When the audience is unsure if it's the end, it's not a good sign. Keep’s ending was a telling sign of the piece. Confusion. There is a lot of promise in this piece, the execution was just not where it needed to be.